Since I group my movies by year, I ended up watching Get Real shortly after finishing Edge of Seventeen for one reason or another. I wasn't exactly intending to go on a little marathon of coming of age movies - it just sort of happened. Or maybe I just have a thing for British movies and TV shows that make it hard to switch away to something else. Get Real has a rather different message though, and one that weighs a little heavier. This isn't a bad thing - again it just sort of happens. It's not like we look at all movies solely in comparison to others after all. That would be rather rude or something. But it's a pretty lengthy film running at 110 minutes, but given the pacing of things and all that needed to happen, the timing makes sense. Still, it feels like it was a pretty ambitious project for the time, especially since it was depicting a period in Britain's history when homosexuality remained highly illicit and thus hardly talked about. And here you this closeted young man whose only certain thing in life is probably his sexuality. Synopsis: Get Real is a British LGBT drama film directed by Simon Shore as based on the play What's Wrong With Angry? Patrick Wilde both wrote the play and the screenplay for the movie. Steven Carter (Ben Silverstone) is 16 years old and remains well inside the closet despite his proclivity for hooking up with strangers at public bathrooms. He's intelligent and introverted with his neighbor Linda (Charlotte Brittain) as his only friend. He's constantly bullied at school and teased to be queer and he finds no relief at home. His Doctor Who obsessed father seems particularly harsh against Steven. A random cruising sessions at the public toilets leads to a note being passed between the stalls and Steven eventually waiting at the bench outside for his hook-up. But he's surprised to find that his mystery man is actually the school track and field jock John (Brad Gorton). Initially John vehemently denies that he's gay but eventually he agrees to drop by Steven's place for "a coffee or something". As they swap stories something almost happens, but not quite there yet. And now John seems conflicted whenever he sees Steven, but he's determined to maintain his popular status at school and thus continues to ignore Steven entirely while on campus. Thus the real story begins. Silverstone's portrayal of Steven was pretty interesting. He's a strong actor and he really carriers the movie well enough mostly on his own. And given how he's in almost every scene, that's quite a burden to bear, so to speak. And I appreciated how he didn't exactly get all mushy and crazy over John. Sure, he was pretty interested, but I think there was a greater intellectual curiosity at work at first, especially since it's so rare to find someone you know that was gay at the time. Gorton's performance as John as a little lackluster. You may end up spending a lot of the movie wondering why Steven ever decides to do more than just hook-up with the guy. His performance was a little wooden and it's see how the two might logically come together in any meaningful way. But the plot demands it, and so it happens. What's a bit more intriguing is Steven's writing and how his thoughts on his homosexuality lead to a greater desire to talk about himself openly. The anonymous article that becomes one of the key plot elements in the movie is all about him trying to find a voice but also taking a stand in support of his fellow gay men. He speaks of the damage caused by the hurtful things that people say and what this might mean for the future. And that's a pretty powerful message indeed. The movie is pretty well done with a lot of scenes that find other ways to convey a message apart from direct dialog. But there are some extraneous bits that maybe could have been edited out since there are times that the movie drags on a bit too long. And I'm not quite sure why they made the dad such a major Whovian - it makes for interesting background material but it seems wasted on being not much else. Steven's father seems to be angry about a lot of things, but we never fully explore this aspect to things. 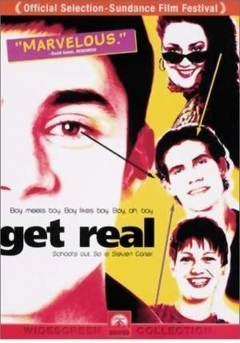 Get Real is a good enough movie, although is suffers from the pains of plays translated into movies. I don't know the original material so I can't make comparisons, but I do get the feeling that elements that might have worked on the stage didn't quite work out here. Still, the movie gets 3.5 hook-ups at the public lavatories out of a possible 5.